you poor devil > Uncategorized > Excelsior! When I was young, in order to entice me to read more, my father turned me onto comic books. That decision changed my life. From then on, in order to get me to bear the boredom and monotony of weekend shopping trips, detours were made to comic book stores. Sometimes, my parents even had to put up with cleaning vomit out of the backseat because I’d make myself carsick reading the comic books in the car on the way home, unable to wait to read them safely in my bedroom. From my interest in comic books came graphic novels and from graphic novels came novel-novels (and dictionaries. Explain “Excelsior!” to an 8-year-old.) And from novels came other books on history, culture, politics, and even science….often at the eschewing of my assigned reading assignments. Also from my interest in comic books came an interest in drawing which lead me to, for a time, a dream of being an illustrator- first of comic books (duh) and then of political cartoons. (What 11-year-old do you know that wants to draw political cartoons?) You can draw a direct line (pun-intended) to me meeting a hometown hero (for his political cartoons), Pulitzer Prize winner Jim Borgman. From illustration came art classes where I met amazing people like my freshman year tablemate Yoni Wolf, my freshman year art teacher Althea Thompson, and of course Wylie Ferguson III who told me that my illustrations were good by my compositions were better and that I should explore photography, something that was always in the back of my mind. And that ended up turning into a passion and a career. Comic books were at the foundation of a lot of my friendships- people I’m still friends with to this day. From playground discussions to seeing the weird guy reading a comic in the lunch-room or on the bus and deciding to say “Hi”, comic books were a big topic among my friends. Zachary, Nick, Andrew, Fuzail, JoVon, Andrew, Collin, Aaron, Gil etc etc etc. Walking into a comic book store in the 80s and 90s, it was hard to miss Marvel Comics. By the mid-80s Captain America, The Incredible Hulk, Spider-Man, and The Fantastic Four were household names. For younger kids, the X-Men were really starting to gain some traction. I found myself as an incredibly awkward pre-teen relating to the X-Men. I could identify with the “otherness” that mutants possessed. Only after scratching the surface of that comic did I realize that X-Men was an allegory for dealing with racism, having been written and conceived in the 60s, but the metaphor was relatable. Later, in the early 2000s, X-Men used the same metaphor for LGBTQ issues and all-round otherness to great effect. All of these characters, and more, were or were nominally the creation of Stan Lee. By the time I could attribute him to his work at Marvel Comics, he was already an avuncular character at the company no longer really contributing to the day-to-day, not the inexplicable inside-joke grandfatherly cameo-superstar of the current Marvel Comics’ movie franchises. Though “just comic books”, all of these characters were allegories for tough subjects I could relate to at the time and opened doors to bigger concepts. The Incredible Hulk? -dealing with one’s emotions or anger. X-Men? -racism and otherness. Spiderman? -responsibility. Fantastic Four? -family dynamics. Captain America? -punching Nazis and the dangers of nationalism. Black Panther- Punching the KKK and ending racism. Dr. Strange? -I’m pretty sure taking LSD…..
One thing that I have always loved about Marvel Comics, as opposed to DC Comics (and some others), is that they often wrote about a human character with human traits and flaws. They weren’t two-dimensional alliterally-named (with some exceptions) caricatures like Superman. Peter Parker was a bratty kid that made a petulant decision that had “real-life” consequences. The parable helped drive home the idea that ‘it’s not always about you’- a great parable for a teenager. Though they were “just comics” they often found a way to write about tough subjects that weren’t one the one hand PSAs or glorifying bad behavior on the other. 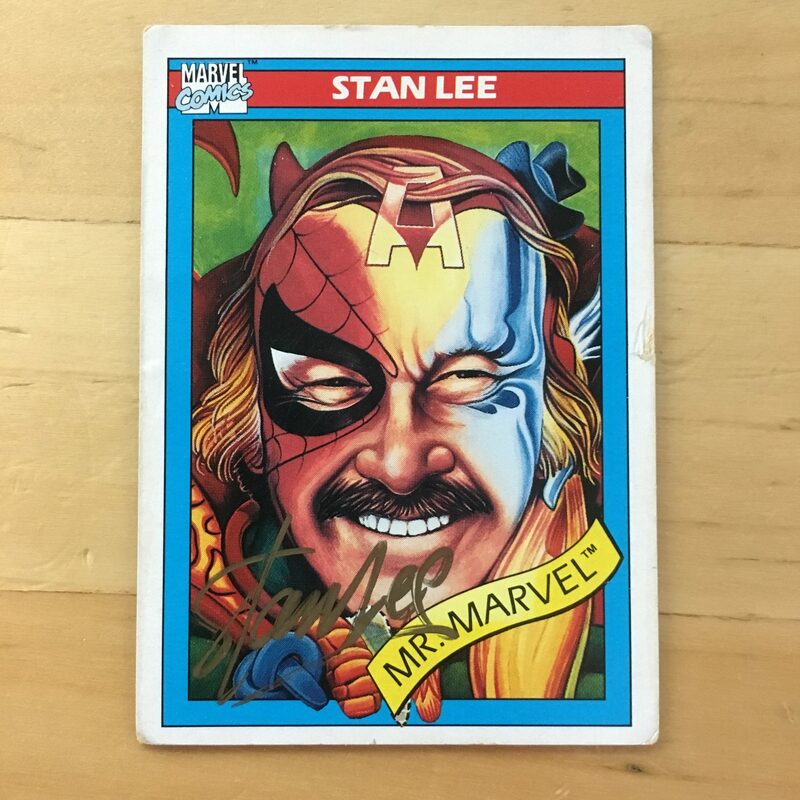 When I was eleven, Marvel Comics created a trading card series, and the last card of the series was an illustrated homage to Stan Lee with many of his characters painted on his face with his identifiable mustache and grin. I was well into my love of comic books at the time and felt inspired to write to one of my heroes. So I did. I don’t remember how long the letter was, but my guess was somewhere between 6-12 pages, full of my brilliant ideas of where to take the characters next and what kind of cool action-figure ideas I had (I’m still available Marvel, if you’re reading this). I included my Stan Lee card #161 and asked for a signature as well, not really expecting to get it back, having already been let down by heroes-past. Sometime later I received a letter with a signed Stan Lee #161 card- in gold ink, and a letter thanking me for being a fan. That card has sat on every desk I’ve had since then. As with all heroes, one should be careful of meeting them, learning too much about them, and/or putting them on too high a pedestal. 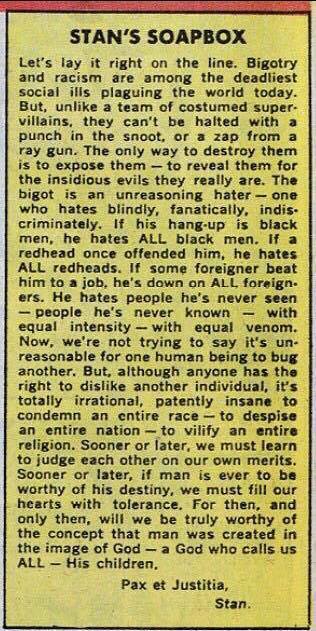 Stan Lee certainly had his flaws, as do we all. But like most of his characters, he was human, and I’d like to think while he was far from perfect, the good that he did and the ideals he wrote about (if not living up to them), made him worth remembering. I’m not sure if there are such things as real heroes, but he may be as close as one comes and is still human. Excelsior! 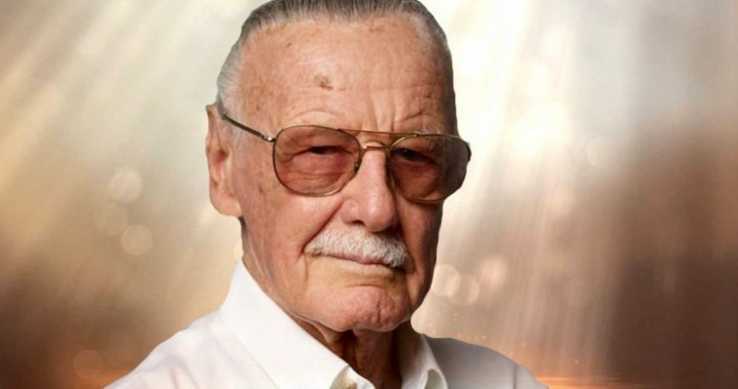 tl;dr – RIP Stan Lee, I’ll miss you. Thank you. ’Nuff Said.